In Chinatown Gangs, Ko-lin Chin penetrates a closed society and presents a rare portrait of the underworld of New York City's Chinatown. 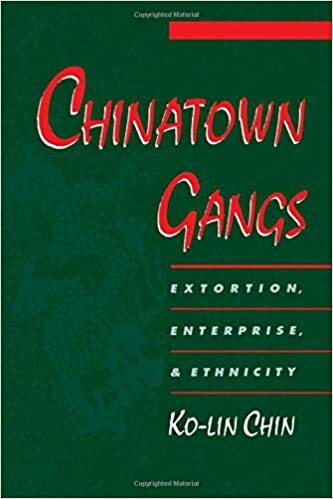 Based on first-hand accounts from gang members, gang victims, community leaders, and law enforcement authorities, this pioneering study reveals the pervasiveness, the muscle, the longevity, and the institutionalization of Chinatown gangs. Chin reveals the fear gangs instill in the Chinese community. At the same time, he shows how the economic viability of the community is sapped, and how gangs encourage lawlessness, making a mockery of law enforcement agencies. Ko-lin Chin makes clear that gang crime is inexorably linked to Chinatown's political economy and social history. He shows how gangs are formed to become "equalizers" within a social environment where individual and group conflicts, whether social, political, or economic, are unlikely to be solved in American courts. Moreover, Chin argues that Chinatown's informal economy provides yet another opportunity for street gangs to become "providers" or "protectors" of illegal services. These gangs, therefore, are the pathological manifestation of a closed community, one whose problems are not easily seen--and less easily understood--by outsiders. Chin's concrete data on gang characteristics, activities, methods of operation and violence make him uniquely qualified to propose ways to restrain gang violence, and Chinatown Gangs closes with his specific policy suggestions. It is the definitive study of gangs in an American Chinatown. area, you should help our operating cost." We won't say it directly. We give them a price, sometimes they negotiate. We take $700 to $1,000 a month from large restaurants, and $100 a week from take-out restaurants. It depends on the area where the business is located. We normally send only two to three guys because we do not want to scare the customers. When a group of gang members (usually four or five) shows up in a store to demand money from the owner, each person is assigned a specific role.